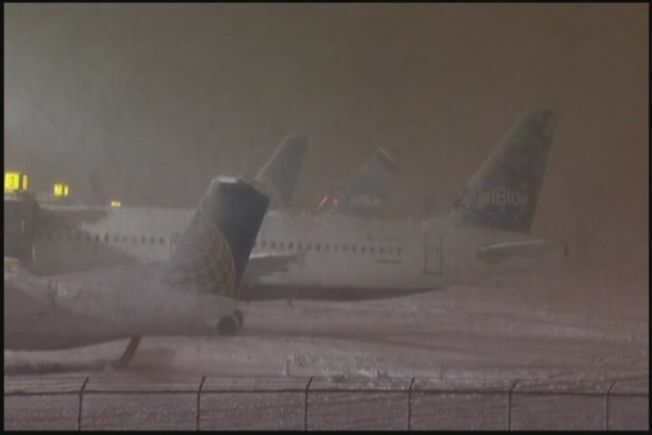 The U.S. Department of Transportation has concluded their investigation into the tarmac delays at Bradley International Airport during a fall snowstorm nearly two years ago. Only one airline will pay a fine with several others receiving letters of warning. The storm crippled airports across the northeast nearly forcing 28 flights to divert to Bradley back on October 29, 2011. A DOT spokesman tells the Troubleshooters that only one airline, Jet Airways out of India, has been fined. Others, Including JetBlue and American Airlines, were sent letters of warning. The longest tarmac delay was a JetBlue flight, in which passengers were stuck for nearly eight hours before the plane was allowed to pull up to a gate and let people off. The only airline to be fined, Jet Airways, was given a $10,000 penalty for a under reporting their tarmac delay by 34 minutes. The results of the inquiry are troubling for U.S. Senator Richard Blumenthal who sits on the Senate Commerce, Science and Transportation Committee. “As long as the fines are insufficient, as long as the companies regard these penalties as simply the cost of doing business, there’s insufficient deterrent effect,” said Blumenthal. The Senator is concerned the DOT findings are a sign of weak enforcement of the 2010 Passenger Bill of Rights. The rules are meant to protect flyers after a series of passenger horror stories of tarmac delays on planes with malfunctioning bathrooms and no food and water on board. The rule states that airlines can face penalties of up to $27,500 per passenger for domestic flights that sit on tarmacs for over three hours or for international flights more than four hours. According to the DOT, since the rule took effect in 2010 only 12 instances of tarmac delays have resulted in penalties levied against the airlines. “The number of strandings which violate the three hour rule we believe is about 200 since the rule went into effect in 2010,” said Paul Hudson, a passenger rights advocate and Executive Director of Flyersrights.org. Hudson says tarmac delays have gone down significantly with the new rules, but there are still an alarming number of delays that he believes can and should be avoided. “The airlines are now balancing a minimal fine against the cost that it requires to obey the rule,” said Hudson. Hudson is pushing congress for what he calls a “Passenger Bill of Rights 2.0” that includes a minimum fine of $3,000 per passenger for tarmac delays, with $1,000 of that going to each passenger. He also wants to see tougher enforcement of the current rules. The DOT would not release copies of the warning letters sent to the airlines. A spokesperson, however, says they included an acknowledgement of the tarmac delay or delays in question, and that there would be no penalty involved. The challenges went beyond the airlines. The FAA has acknowledged its role in diverting too many flights to Bradley during the storm, and the airport had its own cascade of problems that night including power loss and poor communication with the airlines and the FAA. In an interview earlier this year, the airport’s newly installed executive director talked about the hard lessons that storm brought. The airport has an overhauled action plan in the event of severe weather and other unexpected scenarios. The plan incorporates the airlines to ensure planes are brought into the gates and passengers are let off.